The theme of DruFunPark is winter, so it is decorated in winter and mountain themes. There are two improvised helicopters and a buldozer integrated in this park. The park is situated in four levels, this guarantees, that DruFunPark visitors will find lots of different activities in one place and will not get bored. Spidertower (5 m high) – posibility to climb up or down through big spider webs. Sledge mountain – to go down like with real sledge. Straight pipe made of stainless steel – 6,3 m long, 6 m high. Spiral slide – 4 m high. Mazes with lots of mistyrious and interesting toys. Drawing corner for smallest visitors with LEGO and other educational games. DruFunPark covers 487,5 square meters. Maximum hight – 8,2 meters. 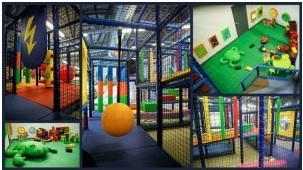 There is room for 260 children to play in DruFunPark.